Building a helicopter that can fly 100 mph faster than current production models, with increased maneuverability, endurance and high-altitude performance, has earned a team of Sikorsky Aircraft Corp. engineers, including Clark School alumnus Ashish Bagai (pictured below), the prestigious Robert J. Collier Trophy--one of aviation’s highest honors. 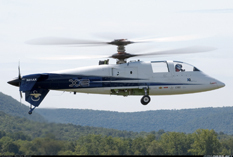 The Sikorsky X2 Technology DemonstratorTM (X2TD) will, according to the company, change the way helicopters operate, delivering higher speeds and radically improved performance in medical, search and rescue and military applications, while maintaining the efficient hovering and low-speed attributes of conventional rotor-wing aircraft. Bagai was responsible for the aerodynamic design of the craft’s main rotor blades, a key element in its success. An aerodynamicist who is principal engineer for advanced design at Sikorsky, Bagai obtained his bachelor’s, master’s and doctoral degrees (’90, ’92, ’95) at the Clark School’s Department of Aerospace Engineering (AE) and worked in the department’s Alfred Gessow Rotorcraft Center. He cites as a primary mentor his advisor, internationally recognized rotorcraft aerodynamics expert and Minta Martin Professor of Engineering J. Gordon Leishman, plus Professors Alfred Gessow, James Baeder, Roberto Celi and Inderjit Chopra. In September 2010, the X2TD flew at a speed of 290 mph (250 knots) in level flight, an unofficial helicopter speed record. Achieving high speed, while maintaining or improving capabilities such as high-altitude flight and maneuverability in confined spaces, was the key objective for the co-axial, pusher-propeller-assisted X2TD. Ashish Bagai, Sikorsky Aircraft Corporation, Stratford, Conn., "Aerodynamic Design of the X2 Technology DemonstratorTM Main Rotor Blade," Proceedings of the 64th Annual Forum of the American Helicopter Society, 2008.